How do you say hoarding in French? 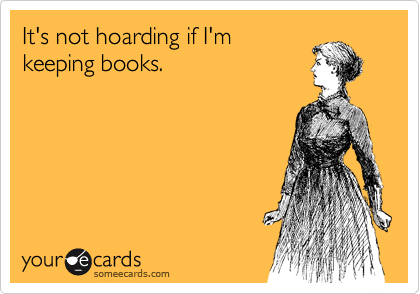 I don’t hoard books. I hoard ebooks. So. The new house. It’s yellow. And pointy. Or peaky. Choose your adjective. We have a lovely sunroom, where the dining table and mom’s big jade tree now live, and beyond that is the backyard. In one corner is a barbecue pit/fireplace kinda thing; one the other side is a big wooden deck where there was once a pool. There are two sets of stairs, one on each side of the house; the set off the front room is skinny and steep, and leads to a loft area with two bedrooms. That’s where Jolene & Max are. Below that is the master bedroom & bath, as well as another room Mom is using for her sewing room, and where the folks clothes hang. There aren’t many closets in this house, for some odd reason, so Mom & Dad had to buy a wardrobe rack for their hanging items. On the other side of the house, off the laundry room (what Martha would call the “mud room”),is my room ,the entrance to the garage, & another set of stairs. These lead to two more small bedrooms with slanty roofs, where Hattie has staked her claim. My room is just below hers, and has the bathroom that we share. The sliding glass door on the deck leads into my little room. I finally have a room that gets some sunshine! I hung colored sheers across the sliding door so I could have some privacy from the neighbors, and bring some color into the place. (The walls throughout the house are the same shade of cream.) I have a closet, too. My only complaints about my room so far is that there isn’t any lighting in the closet (I fixed it by hanging fairy lights), and that my window is painted shut. I’m going to have to work on getting it open, because I hate not having any fresh air! I could just open the sliding door, I suppose, but that’s a bit more air than I need. I haven’t done much decorating here in my space yet, other than the curtains. Usually I have a couple of bookshelves taking up most of my wall space, and here, it’s all bare. So I’m taking my time, deciding where to hang the few things I’m going to hang. I did hang my Eiffel Tower poster in the bathroom–which is also yellow, by the way–and put some other tower accents in there. I plan on speaking with a French accent every time I take a shower. Oooh la la.